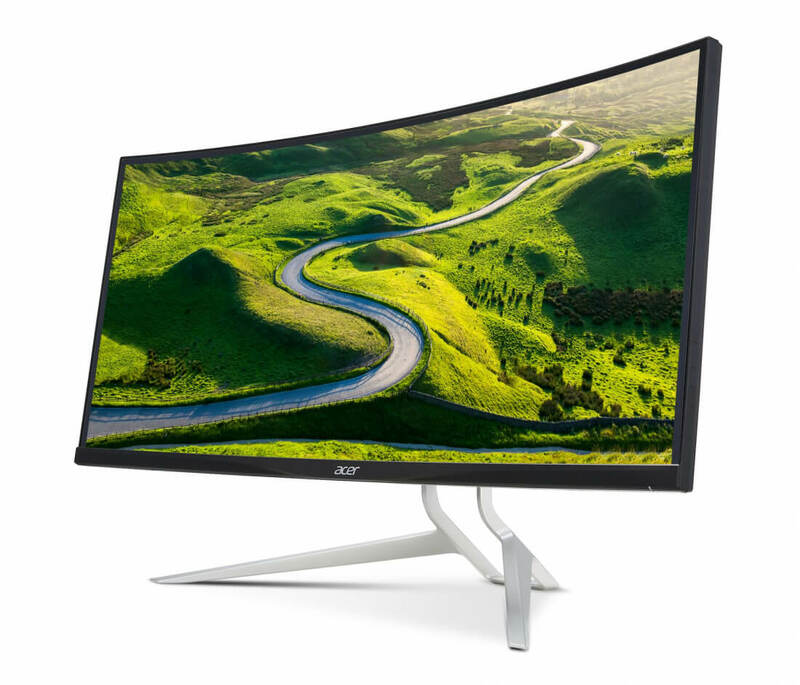 Acer has announced that their new XR382CQK monitor is officially available for sale in the U.S. The ultrawide monitor sports a 3840x1600 resolution and measures a huge 37.5 inches diagonally. Complementing the vast amount of screen real estate, the display also has a 2300R curve and a 75Hz refresh rate. Response time at 5ms is slightly slower than many gaming monitors, but given the monitor size and resolution, it's more than adequate. Behind the scenes is a FreeSync capable display driver to help match the screen's refresh rate with the GPU frame rate output to reduce tearing. The panel itself has narrow bezels and provides viewing angles of nearly 180 degrees both horizontally and vertically. Acer claims the XR38CQK delivers on the color department with 100% sRGB coverage. The stand offers tilt, swivel, and height adjustments built right into the aggressive and futuristic looking frame. The monitor comes with HDMI 2.0, DisplayPort 1.2, a 4-port USB3.0 hub, and a 5Gbps USB 3.1 Gen1 Type-C (wow, that's a mouthful) port. Like nearly all gaming monitors, there are plenty of fancy display settings to adjust like backlight flicker, low blue-light mode, low-dimming technologies, and more. To no one's surprise, the monitor also features various lighting effects that can be adjusted through the OSD menu. The monitor -- if 38" is something you can still call a monitor -- doesn't come cheap. At $1,300 it's one of the more expensive gaming monitors on the market, but it sure does look like a stunning display.